Macro and portraits with a low cost is possible to get with Tamron 60mm macro lens. It is a true macro lens with a 1:1 magnification ratio. After photographing for a while, you will realize that the practical, easy to always go, favorite for our busy daily life is the focal lengths within the range of Macro to Portrait Lens. Except professional photographer, honestly using a 400 mm Lens is not required by a serious amateur, because honestly we have less scope to use it everyday. This is a social aspect of the respective varied niche which uses that focal length range. Not only that, we will always found often the challenge thrown by the technical limits of the when trying to get as close as possible to the subjects : to discover the hidden detail and have a lot of focus. Macro and portraits with a low cost lens is desirable. The available budget is reduced as always to the most, so we went looking for a good compromise between price and performance. Obviously, we came to Tamron. The requirement for the price immediately excluded all brands, which were more expensive. For this we came to identify the Tamron 60mm and 90mm. Why the choice fell on it first? We would have preferred the 90mm because often, for wider taste, better is the greater focal lengths. However, on the internet we found an unanimous negative judgment about the slow focus. Practically, the 90mm is only usable if you can take time to focus. If you want to make a spontaneous portrait on the fly, such as at a party, hardly it is usable. Finally, the length of 60mm, multiplied by the crop factor (1.5x in our case) gives a focal length of traditionally optimal for the portrait. So, we decided to 60mm. 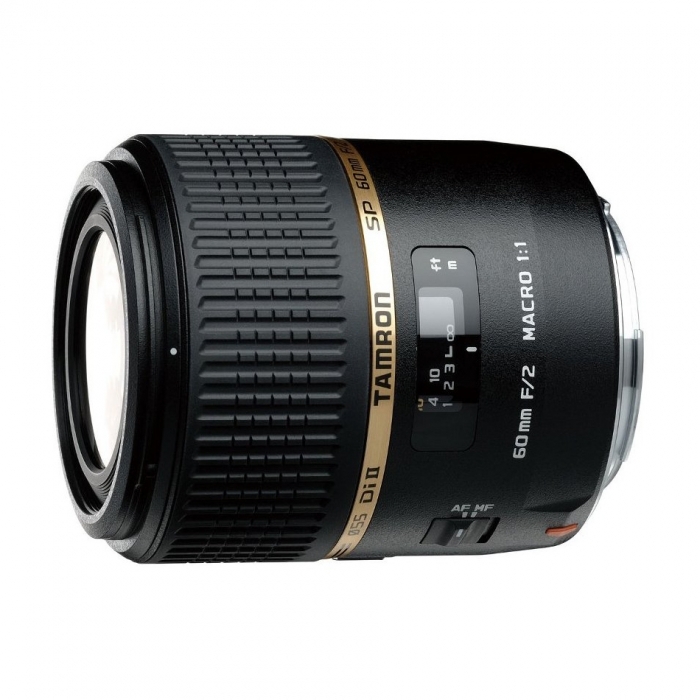 Due to the fact that it is a fixed focal length lens, the Tamron AF 60mm f/2 SP Di II LD [IF] Macro is lightweight and compact. So, it is very convenient to carry around to snap spontaneously and has a place in any backpack. If you are in a position to do macro freehand, a lenswhich is so light allows you to aim and focus with a very steady hand. A heavier one easily can lead to blur. Between coats we found it quite solid, although there are elements made in typical economy grade plastic which definitely tells the story – “Made in China” with questionable Quality Control. We are not going to going buy a MacBook Pro or any Class A a Sedan, its a deliberate purchase of a HP’s economy grade laptop. We need the main work to do. In macro photography you will often find yourself using the manual focus, so it is important to think about the fluidity in the movement of the ring to focus. At first glance, this seemed a bit stiff, as if there were some resistance. However, this feeling is gone now after 1K plus shots and we never had problems in focusing (except those are dependent on poor visibility of the camera’s viewfinder, which is another story). This is mainly due to the fact that the focal length allows to move the focus ring much more than a normal lens. Consequently, the focus is very precise. In other words, a manufacturing bug normalized it – if you are too much technical. You can not expect the feel of BMW X5 from Toyota Innova. It is probably better to think in the line of the fox of the old fable about unreachable grapes. First of all, the pictures created with Tamron AF 60mm f/2 SP Di II LD [IF] Macro are very sharp. Along with this, the colors are still quite bright and above all credible. When you will use the maximum aperture of f / 2, it becomes obviously that it will be more difficult to focus on a point because the depth of field is very shallow, however; the blurred (bokeh) is very pleasant. With regard to distortion or chromatic aberrations, we have not noticed anything special. A small defect might be a tendency to overexpose. It could be a phenomenon limited to a certain range of exposure, but sometimes you get slightly overexposed photos. You can see it by your eyes on the camera screen. It is easy to overcome by setting a negative exposure compensation in Adobe Photoshop custom action script for the lens while importing, so that the process can be automated. So Tamron AF 60mm f/2 SP Di II LD [IF] Macro is like Toyota Innova. A MUV that works for the most. The problem, funnily is same that like Innova – there is a problem of stability while shifting to 3rd gear. Comparison is obviously with the counterparts which are few times more priced, may be really of a different segment. With a Tripod, honestly it will deliver you a good mileage. Other thing is also like Innova – it makes a bit sound, not really a silent lens. We mounted it over various bodies, there is not really so much issues than people complains. The comparison of Innova and X5 comes again, at that price; we are not aware of such quality offered by other brands. Cite this article as: Abhishek Ghosh, "Macro and Portraits at Low Cost with Tamron 60mm Macro Lens," in The Customize Windows, June 28, 2013, April 23, 2019, https://thecustomizewindows.com/2013/06/macro-and-portraits-at-low-cost-with-tamron-60mm-macro-lens/.